The adorable Colorful Owl Behavior Bulletin Board set offers a creative way to to manage students' behavior. Teachers write students' names on owl accents and behavior management levels on the tree. Students move their owls up and down the tree based on their current behavior. This versatile set can also be used for other classroom management tasks such as centers, small groups, or even job assignments! 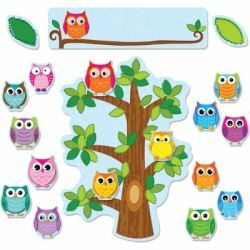 Includes 70 pieces,1 header ,1 tree, 32 owls, and 36 leaves. Look for coordinating products in this design to create this popular classroom theme!